Scott Evans - voice, guitar. Kowloon Walled City is a band who have a dedicated and loyal fan base including ourselves at Sludgelord. 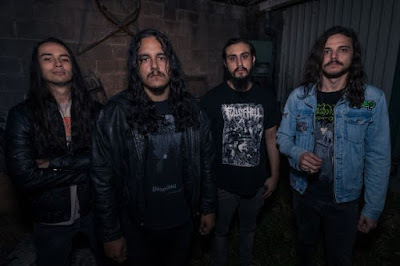 Their blend of hard-hitting dirge infested Sludge Metal mixed in with Harsh Noise Rock has seen them receive praise from the underground press and fans alike. Ever since, they released their debut EP – Turk Street in 2008 and subsequent debut album in 2009 – Gambling on the Richter Scale. Kowloon Walled City showed the world that they were not afraid to show life how it really is. Bleak, Mean, loud and angry just like their music. Well 3 years after their brilliant debut album, Kowloon Walled City is back with a vengeance. Their new album – Container Ships – features some of their finest work to date. Newly signed to Brutal Panda Records, Container Ships feature Kowloon Walled City most creative work yet. First track – The Pressure Keeps Me Alive – starts with a more restrained Kowloon Walled City than ever before. The lo-fi guitar riff setting the scene that sounds fresh but vaguely familiar at the same time. Wait around the 2nd minute before vocalist Scott announces to the world – “Can you take it slow” - The answer on this heavy pounding track is a resounding NO. Kowloon Walled City does not care what you think. They play slow-pace/mid-tempo riffs full of anger and passion. Kowloon Walled City might have lost a bit of their rough DIY edge to their music from previous releases but it is great to hear the band louder, clearer and angrier than ever. This track is only the start of a more refined Kowloon Walled City. 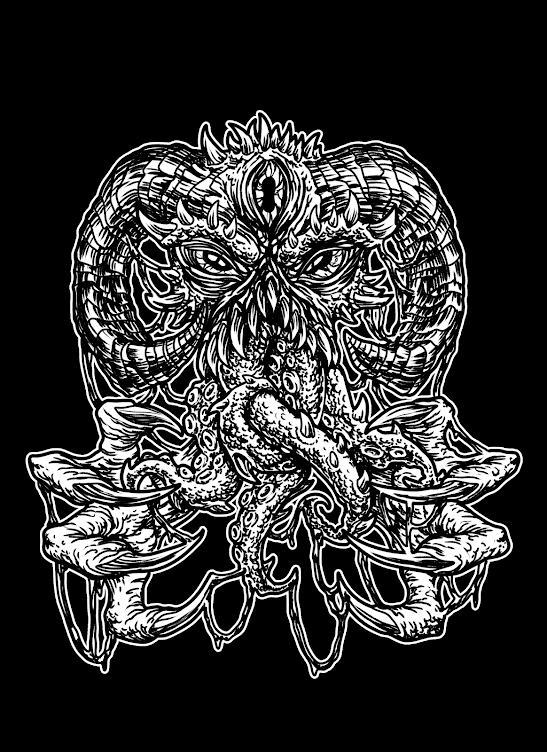 This band is ready to stake their claim as one of the best bands of Sludge Metal/Noise Rock. And there is nobody going to stop them on this form. Up next is one of the album’s stand out tracks – 50s Dad – A 3:27 minute track that features sublime angry based lyrics and vocals from Scott. This is where the rest of the band shows their talents as well. The interaction from the band is intense. The drums and duelling guitars give 50s Dad a life of its own. The lyrics providing a bleak story that sounds like a personal history lesson from this great band. It is awe-inspiring stuff. A personal history lesson you will always be happy to be listening too. 50s Dad shows what superb underrated songwriters Kowloon Walled City actually are. Beef Cattle is more familiar Kowloon Walled City territory. Blending harsh sludge rock vibes with added grizzled noise rock landscapes. The drumming is simply immense here. Adding an extra layer of authority to proceedings. It feels like the vocals and guitars were built around the drums on this track, as they are the major driving force here. But Kowloon Walled City do have another social tale of disharmony in the ranks to tell. Up next is the epic 7:11 minute title track - Container Ships. This is a track where Kowloon Walled City show the world what they are now made of. This has a slight Post-Metal edge to it. The way it starts building up the atmosphere with slow-paced Sludge based guitars and intricate drumming. You know with this being Kowloon Walled City the fireworks will eventually kick off. Believe me they do. But enjoy the instrumental ride before the 2:30 minute when Scott kicks this song into life. Scott is not just singing to you. He is outlining a statement of intent to the entire world. They are telling you what is wrong with the world.. This t rack is a song full of passion and determined anger that features Kowloon Walled City best lyrics to date. They were written for a purpose and it is a song with a thought provoking message attached. It is up to the listener to figure this out for themselves. Other tracks such as Cornerstone and Wrong Side Of History carry on the bleak and unsettling tales of modern life with more down-tuned riffs to shake your fragile mind to. Both tracks have sublime riffs that will leave you breathless. It does for me every time I listen to them. It takes this album into the realm of class status. Last is the almost 9 minute epic – You Don’t Have Cancer – a track that is possibly Kowloon Walled City finest work to date. A haunting tale with beautiful atmospheric Sludge guitar riff matched with the creative intensity of sublime noise rock driving it through. Scott paints an eerie picture with his emotionally charged vocals. I don’t know if Scott is speaking from experience but this is a gut-wrenching conclusion to a collection of outstanding tracks. Kowloon Walled City have always been a social conscience band but they take this part of their music onto another level. They have delivered a truly astonishing album. This should hopefully take this band to the next level as they truly deserve their shot at the big time. The album is expertly produced and one that shows off Kowloon Walled City talents to hard-hitting brilliance. The album will leave you wanting more. My only complaint is – We might have to wait another 3 long years before their next album. And that is too long not to hear from these extraordinary Sludge Rockers. We at Sludgelord rate this album not only as Kowloon Walled City best work to date but possibly one of 2012 best offerings to date as well. This is a must have record you should all own when it’s released on Dec 4th 2012 on digital and physical copies on Brutal Panda Records.